Are you using the hunger scale? Let's build the skill to minimize mindless eating! Click here to learn how to be a more Mindful Eater! We all need calories, but the long standing belief that counting the amount of calories you eat as an effective way to manage your weight, needs a second look. It's time you learn to make peace with those little friends called calories. Do you really need to eat breakfast? 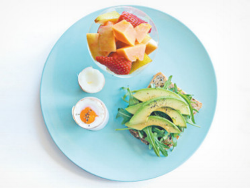 Can breakfast help with your health goals? Become and expert in the anatomy of a powerful breakfast!